The optimist’s take on MLB’s 2015 pennant race goes something like this: If we do end up with several meaningful series at the end of September, we will have had a wild few weeks. It’s still mathematically possible for the right sequence of slumps and hot streaks to lead to an upset or a massive tiebreak scenario. But the pessimist’s response is simple: Point to the playoff odds. As of Tuesday morning, seven teams had playoff probabilities of at least 99 percent; eight were over 92 percent, and nine were over 84 percent. Some seeding is still undetermined — particularly in the AL East and West, where the first-place Blue Jays and Astros, respectively, are trying to bypass the play-in game — but the AL’s closely contested second wild card, which is still within reach of the Rangers, Angels, Twins, and Indians, is the only spot at which teams are fighting to avoid immediate elimination. But baseball’s big finish doesn’t have to be boring just because the playoff picture is almost fully developed. In the absence of a memorable prelude to what could be a momentous October, we can manufacture some regular-season suspense by diverting our excess attention to the race for the worst record in baseball, which doubles as the race for next year’s no. 1 draft pick. In a recent edition of his newsletter, Joe Sheehan surveyed this season’s head-to-head records and concluded that “The NL East is awful.” That one-sentence observation sums up the state of the worst-record race, whose lucky winner will probably be one of the East’s three way-out-of-contention teams. Whatever professional or financial losses you’ve suffered in 2015, you’re probably having a better year than the NL East. As measured by interdivisional record — its collective performance against opponents outside the division — the NL East is the worst division in a decade, and the third worst since MLB’s most recent round of expansion. No NL East team, not even the 76–61 Mets, has a winning record against teams outside its division. The Marlins, Phillies, and Braves are a combined 94-149 (.387) against non-NL East opponents. And as Sheehan noted, the three worst NL teams outside of the East — the Brewers, Reds, and Rockies, who’ve run up a .397 winning percentage against non-NL East teams — are over .500 against the East as a whole (49-44). Old Man of the Mets Bartolo Colon is the NL East personified: He has a 2.51 ERA in 13 starts against NL East teams and a 6.13 ERA in 14 starts against everyone else. As averse to victory as the NL East’s also-rans are, one of these teams will win inadvertently by bringing up the rear. Let’s handicap which of the three has what it takes to out-lose the rest of the league. “Baseball’s biggest loser” is a title no team wants to defend, but the dubious distinction comes with a consolation prize. Although results by draft position fluctuate wildly from year to year, no. 1 picks are much closer to locks than the players picked in any subsequent slot. Historical draft data from Baseball-Reference reveals the size of the disparity. Even relative to second and third selections, no. 1 overall picks are more likely to reach the majors and much more likely to excel there. 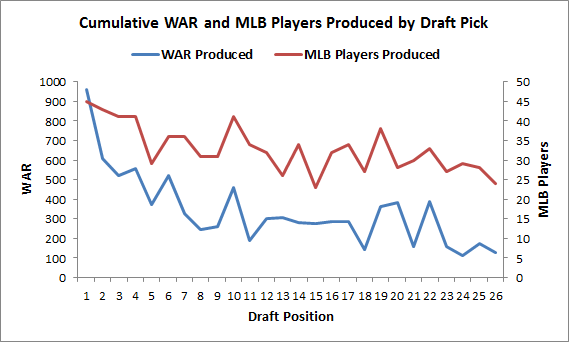 Since the first amateur draft in 1965, first-overall selections have produced 57 percent more WAR than second-overall selections. In some years, though, there’s no clear separation between the first couple of picks. In 2015, evaluators were divided over Dansby Swanson, Alex Bregman, and Brendan Rodgers, the three shortstops who went first through third, respectively. Nine months from draft day, 2016 looks just as jumbled, with no Harper or Strasburg in sight. According to Kiley McDaniel, lead prospect writer for FanGraphs, there’s “no super duper guy right now.” ESPN analyst Keith Law says the Class of 2016 is shaping up to have “a better top 10 than this past year, but if we are going to get a consensus no. 1 he hasn’t emerged yet.” McDaniel names Florida lefty A.J. Puk and California high school center fielder Blake Rutherford as the current leading candidates, but several others could easily surpass them next spring, including New Jersey prep southpaw Jason Groome, Louisville outfielder Corey Ray, and a trio of right-handers: Oklahoma’s Alec Hansen, UVA’s Connor Jones, and Stanford’s Cal Quantrill (son of Paul), who was considered a strong contender for the first pick before undergoing Tommy John surgery in March. There’s plenty of time for one of those players, or someone from the field, to put some distance between himself and the second-sexiest pick and make the worst record count. The site’s simulations, which factor in each team’s current roster and strength of schedule, forecast the Marlins and Braves to pick up their paces while the Phillies sink still lower, becoming the only team to lose at least 100 games since 2013. With Ruben Amaro’s prospects of returning in 2016 looking up slightly, Miami might be the most likely of the three teams to fire its front office this winter. But the Marlins’ rumored overhaul has more to do with a thin farm system and a bad owner’s eagerness to blame everyone but himself for the franchise’s 12th consecutive playoff-free season than it does with their outlook for the final four weeks. The Marlins are four games up on Philly and two games up on Atlanta, and there’s little reason to expect them to relinquish those leads. Unlike the Phillies and the Braves, who are probably lucky to have as many wins as they do, the Marlins’ Base Runs record indicates that they’ve been better than their 81 losses suggest. If there’s a reason to pick the Marlins to finish in the cellar, it’s that their recuperating stars could still suffer setbacks. The Marlins’ 69-win projection above is based on playing-time estimates that allot 59 plate appearances to Giancarlo Stanton, but there’s a chance that Stanton won’t make it back from his broken hamate bone before the end of the year. Similarly, Carter Capps is still experiencing elbow discomfort, and while Jose Fernandez could be back next week, one twinge is all it would take for the team to seal him in amber until 2016. The Braves won a baseball game on Monday, the first time they’d done so since August 24. They entered the day having lost 19 of their previous 20. Naturally, it took an NL East team to get Atlanta out of the loss column: the Phillies, and human slumpbuster Aaron Harang, who’s allowed a 7.80 ERA and a .328/.390/.567 slash line in 14 starts since the start of June. The Braves have been baseball’s worst-hitting team — albeit only slightly worse than the Phillies and Marlins — averaging an MLB-low 2.61 runs of support in outings by Shelby Miller, who’s up to 20 straight starts without a win (which is tied for the fourth-longest stretch of the wild-card era) despite recording a 3.46 ERA since his victory on May 17. They’ve hit only 85 home runs, 16 fewer than 29th-place Miami. And their pitching staff has been hit so hard that they might actually be missing Mike Foltynewicz, who’s allowed more homers in 86.2 innings (17) than any Braves batter has hit. No team can claim to be colder than the Braves. The Phillies finished the first half 29-62 (.319). Then something strange happened: Between the All-Star break and August 9, they went 16-5, posting the best record in baseball over that period despite trading Jonathan Papelbon and Cole Hamels in late July. The unexpected hot streak was a useful reminder not to put too much stock in any 20-game span. No sooner had columnists started praising interim manager Pete Mackanin for working clubhouse miracles than the magic dried up, giving way to a more Phillies-like 8-18 (.308) stretch. The Phillies were the popular preseason pick to be baseball’s worst team. As expected, they’ve been the worst team to date, and they’re projected to be the worst team between now and early October. Between their tire-fire rotation, Maikel Franco’s fractured wrist, and the fact they have a harder schedule than either the Marlins or Braves (largely because they can’t face themselves), there’s no reason not to expect the Phillies to draft first in 2016. Whether the reward justifies the suffering will depend on whether the player they pick more closely resembles recent successes J.P. Crawford and Aaron Nola, or the string of first-round flops that helped make them the best at being bad. Thanks to ESPN Stats & Info, the Elias Sports Bureau, and Hans Van Slooten for research assistance. Independent of the opponents’ upcoming schedules.